William and Anna where born with perfectly shaped heads but their heads started to become flat very soon afterwards. Health Visitors and Paediatrician kept telling us the same old story (they would grow out of it once they start rolling over) and advised on repositioning. We had also tried osteopathy, especially with Anna as she had problem turning her neck both sides, but things were just getting worse for both twins. William’s head looked really bad. I decided to try something else as I didn’t want to end up with helmets for both babies and couldn’t afford it either. 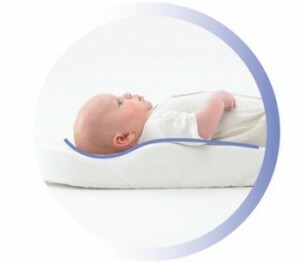 I searched the web and found a mattress called Sleepcurve http://sleepcurve.com/ that you put on top of the cot mattress. It was expensive but I found 2 used mattresses on eBay (and bought 2 new mattress covers). Anyway, even buying new it’s still less expensive than 2 helmets so we decided to give it a try and we haven’t regretted! it worked for both babies! Their heads are now perfectly shaped and it was money well spent. You can only use the mattress until the baby can roll over so it’s better to use it for prevention or quite early anyway.